I’ve been a bit remiss updating the walks from November, so the descriptions are a little briefer than normal. 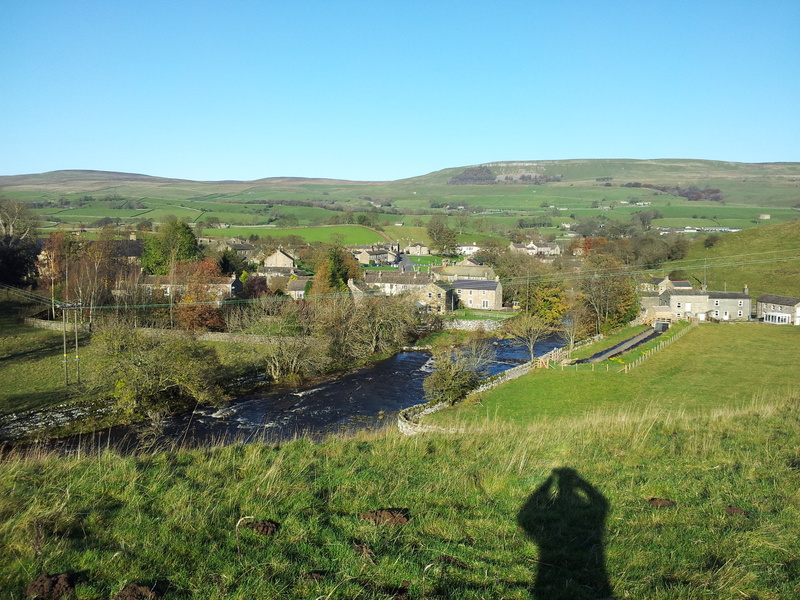 On the first full day of a week staying in Wensleydale we enjoyed a beautiful sunny day. starting off from the village of Bainbridge we headed east along the A684 before turning of south onto a path alongside the road into Raydale. 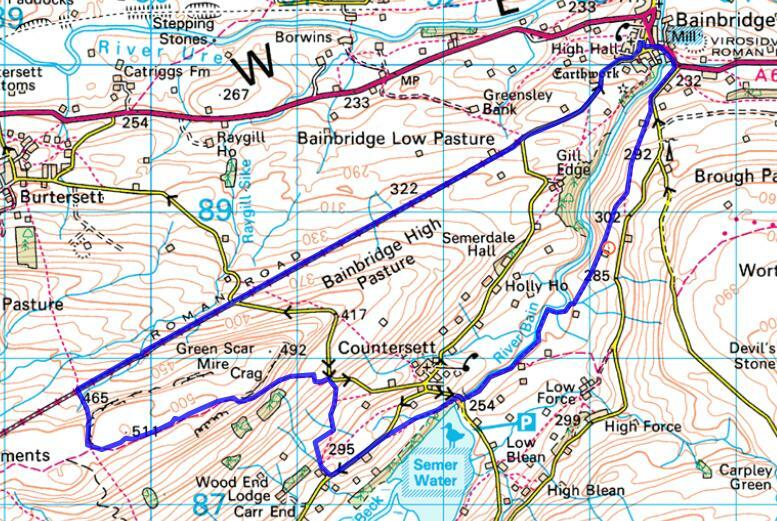 The path continues slowly up onto a ridge just south of the Bain, with excellent views of the waterfalls in Bainbridge, and beyond that the village of Askrigg; and to the south the distinctive stone edge brow of Addlebrough. As we drop down into Raydale and meet back up with the Bain the going becomes incredibly soft, and it takes some time to pick our way through the mud. We cross the Bain as it leaves Semer Water and just before the village of Countersett we head off through some woods and meet up with the road to Marsett, halfway along which we cut north up a farm track and onto a filed so steep that we can barely walk upright. We stop halfway up the field and stop for lunch looking of Semer Water and Stake Fell, after that brief rest we continue up through the field and then with some relief start to cut diagonally across the hillside. We meet Crag Side Road only momentarily before taking the footpath that passes just to the south of the Crag and heads west up onto the breezy fells, we stick to the path as there are shake holes everywhere. The walk to this point had taken us longer than expected due to the muddy conditions so we decided to change our original intention of following the path to Wether Fell, instead we find a path alongside a beck and drop down to meet the old Roman road (Cam High Road). 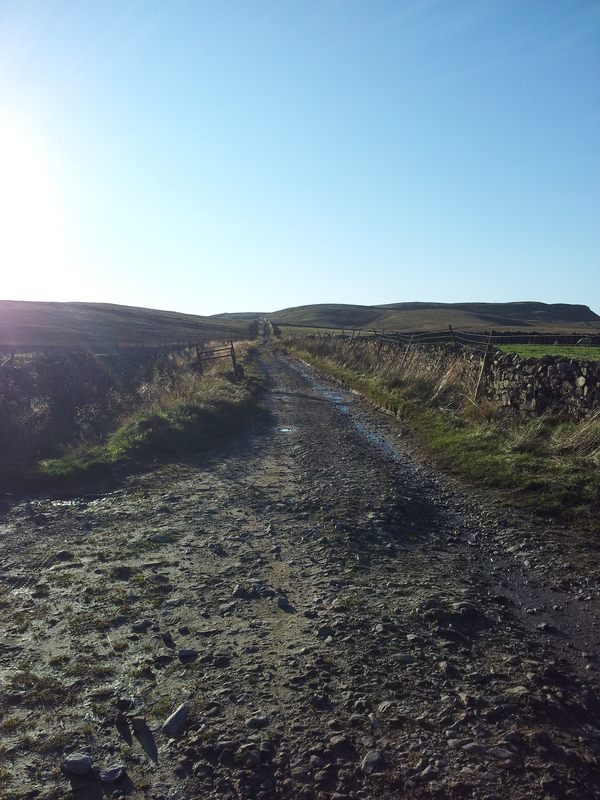 It is then a long, straight walk back into Bainbridge, the road is rocky though and is tough on the feet. We encounter a man in a 4×4 who is attempting to drive Cam High Road, I don’t think it would be an issue in a proper off-road vehicle, but this was more of a Chelsea tractor, not sure it was the wisest venture. All in all – a very good walk.